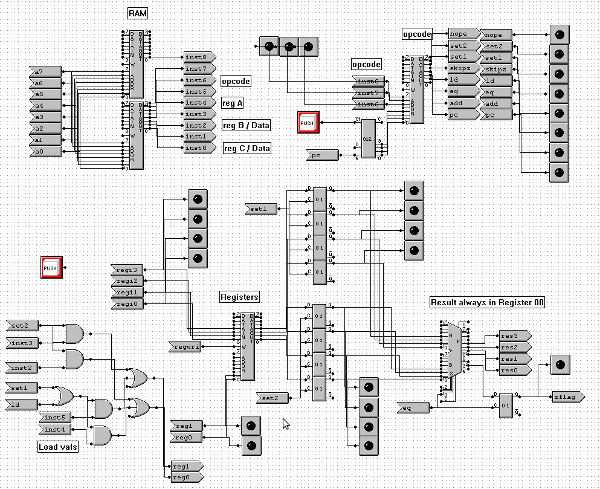 Download the mmlogic schematic here, the memfile here, and the cache file here. The clock is run at a very slow speed so you can see what is happening. I didn’t bother to stop the memory/cache from outputting, so there is a constant read. The input is a memory address, which is fetched from Cache (if the data is in Cache) or RAM (if the data is not in Cache). The part of the system not being used (RAM or cache) is always doing stuff, but this system just throws it away if it is not relevant, and keeps it if it is. The Cache is done using a direct addressing scheme. The addresses are stored in the “higher” half of the addresses. For example, the data at 0000xxxx in the cache has the address in RAM stored at (in the cache) 0001xxxx. At first, the program begins. Because there is a default read, the instruction is to read 00000000 out of RAM. The Controller will check to see if this value is in cache (page 4). It checks this using an ALU and zero flag. It is not, so memwrite (the zero flag output) will be set to +1. This indicates to output the value from RAM. The value is output from RAM, and put in cache. Because there is a constant read, the value at RAM 00000000 is read again, but this time, it is in cache. The ALU will compare the value at Cache 00010000 with the address, and they are equal, so ZF flag is set. Flip any switch, the process above repeats. Flip the switch back so the address is once again 00000000, and notice that the value is only read from cache. 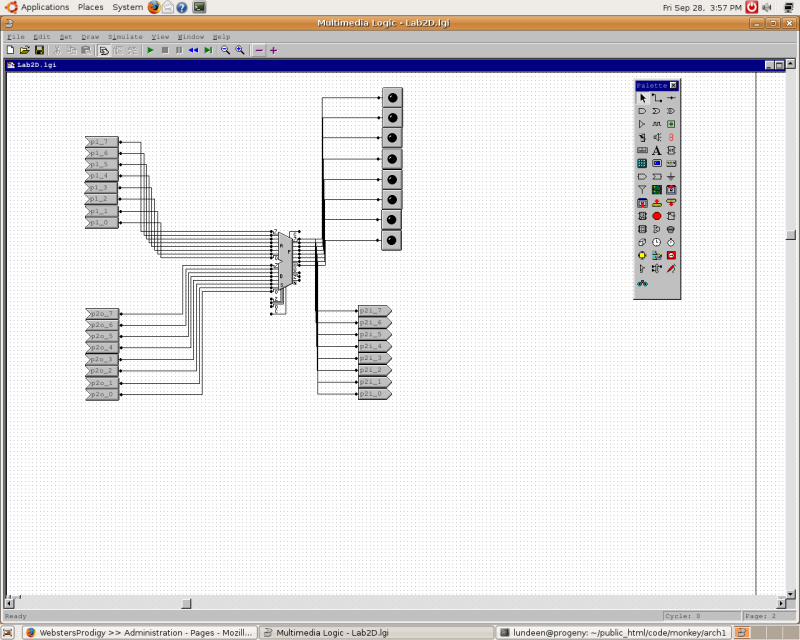 The logic analyzer will be a mess, because of my use of oscillators. I recommend debugging by sight and LEDs. The oscillators function as a system clock. This is a synchronous system. The control address oscillator is constantly moving back and forth between where the data is stored and where the address is stored in cache. It oscillates at a slower speed than the write oscillator. 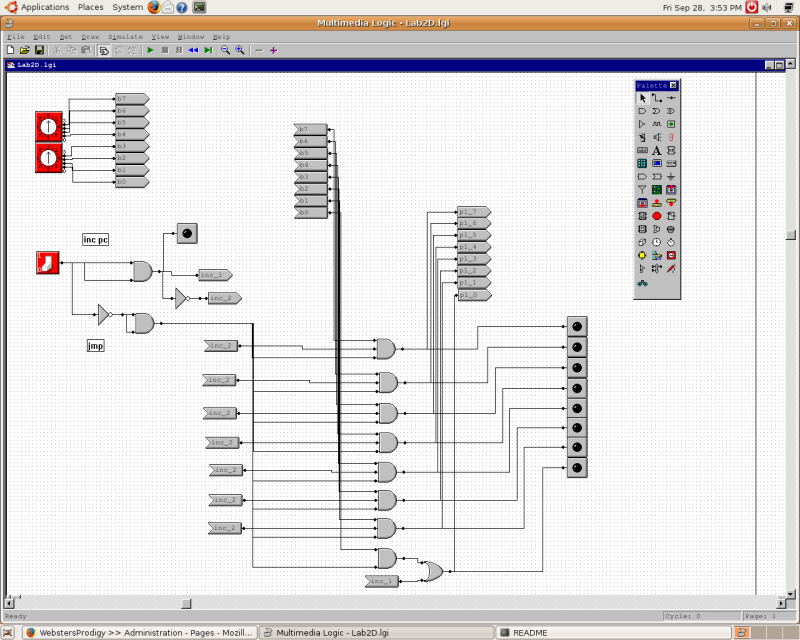 This is part of a project to build a complete, functional, extremely basic microcontroller. It is built using multimedia logic. This section is a simulated very simplified DMA. The test of writing back and forth bytes seems to work. Select head 1, track 2, sector 3, block 4 on the disk. Select address AB on the RAM. Select 6 bytes to transfer. Hit the transfer button. The yellow download LED should illuminate. Hit the clock at least 7 times. Your transfer should stop after the 6th cycle, illuminate the green completion LED, and deactivate the yellow download LED. Select head 2, track 3, sector 4, block 5 on the disk. Select address AC on the RAM. Select 2 bytes to transfer. Hit the transfer button. The yellow upload LED should illuminate. Hit the clock at least 3 times. Your transfer should stop after the 2nd cycle, illuminate the green completion LED, and deactivate the yellow upload LED. You should see 2 bytes transfer from RAM addresses AC and AD to disk blocks 5 and 6 on head 2, track 3, sector 4. These should be the second and third bytes you saw in the download example. You can’t have reads/writes across different tracks or heads, which will produce (perhaps to the user) unexpected results, overwriting the same sectors rather than proceeding to the next track. In short, reading/writing across tracks requires multiple reads/writes. I made a conscious decision to not worry about the clock wrapping around at this point. If the clock does wrap around, it may screw stuff up. This is a functional subsystem that manages a small RAM in our architecture speed across 2 128 byte memory addresses. All the Input and output can be viewed from the first page. The tristate devices on the input (address and data pages) are probably not necessary, and on the solution I saw were not there. However, they were the only way I could think of to have an active disconnect rather than a zero or one. There is a lot of complexity added because of this. Also, there would have been additional complexity that would have been added if the read were not active. But because of the email sent earlier modifying the specifications, this is not the case and I have left the read in active mode (if you are not writing, you are reading). This is a fully functional program counter (PC) that runs on a 1 second clock. On page 1, there is a switch. If the switch is set to 1 then the PC increments by 1. If the switch is set to 0, the PC increments by an 8 bit amount that is specified by the 2 select buttons above the switch. Note that initially the switches are bothset to 0, meaning that if turned on this will not increment the PC. On page 3, the switch indicates a reset switch, and before anything is done, this reset switch must be flipped to a 1 value. The 1 second clock is located on this page, and can easily be swapped out with a push button or oscilator. On page 2, the 8 output led specifies where the PC is currently located.